The Time the U.S. Invaded a Japanese Submarine Base... in Alaska? An absolutely fascinating but little-known story—described as a "forgotten theater" by the U.S. Navy itself—is the tale of Kiska and Attu, Alaska: two remote Aleutian islands where the Japanese military established a submarine base during World War II. The islands—surprisingly close to the outer edge of the Japanese archipelago—were to serve as a landing point and restocking way-station for the Japanese on their way to a much larger invasion of the American mainland. What ensued, however, was a harrowing 13-month period of submarine and naval warfare, including the all-out shelling and aerial bombardment of an enemy encampment constructed on U.S. territory—but not yet a U.S. state, as Alaska would only become the 49th state of the Union in 1959. Nonetheless, the fact that there is a ruined Japanese submarine base on U.S. soil is extraordinary—and something only the most astute history buffs seem to know. How it got there, and how it was destroyed, is an incredible story in its own right. Supply headquarters in Gertrude Cove, Kiska Island, August 1943. Aerial view of landing craft pulled up to beach in cove; shoreline covered with supplies, provisions, and materials to support U. S. troops on Kiska; image and caption Alaska State Library/Alaska's Digital Archives. While the island of Attu was subject to an actual ground attack, including U.S. soldiers dropped onto the island behind the Japanese forces in order to flank them and help push them into the sea, Kiska was successfully abandoned by the Japanese—who secretly escaped in the fog, leaving their abandoned base and many of their supplies behind them—before U.S. troops could manage a landing. 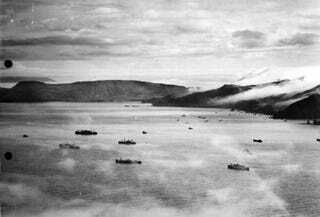 With Attu retaken, attention shifted to Kiska, which was blockaded by a ring of destroyers and bombed regularly, weather permitting. A powerful surface bombardment force, including several old battleships, pounded the island on 22 July, and an invasion fleet was assembled for an assault in mid-August. Meanwhile, however, the Japanese had reluctantly decided to relinquish the island, and 13 large I-class transport submarines were assembled to evacuate the garrison. This plan was revealed to the U.S. high command in a series of cryptologic intercepts, and after seven of the 13 I-boats were lost or crippled in evacuating only 820 men, that approach was abandoned. Instead, on 28 July, under a heavy fog, the Japanese managed to sneak in two light cruisers and six destroyers and spirit away the remaining 5,200 personnel without being detected by the waiting Americans. When the latter came ashore after heavy bombardment on 16 August, they found Kiska entirely abandoned. The Japanese had held the western Aleutians for only 13 months. Despite the relatively short time of Japanese occupation, the troops—joined by Canadian soldiers—found ruined radar stations, submarine repair and assembly pits, ruined seaplane hangars, mud-choked roads, and even a network of deep defensive tunnels built into the island. The surreality of what they found there is well-captured by these photos, a kind of military dreamworld embedded in the mud and tundra, surrounded by craters and often covered in places with graffiti left by the retreating Japanese. Entrance to tunnel near Japanese sub base on Kiska, August 1943. Tunnels gave protection to the Japanese against bombs and provided sleeping quarters; image and caption Alaska State Library/Alaska's Digital Archives. As the Navy adds, "It had to have been the worst duty in the world. The privation, hardship, and danger endured by the more than 1,000 U.S. submariners who served in the Aleutians during 1942 and 1943—most of them in small, obsolete, and worn-out boats," fighting with old equipment for "the frozen and desolate islands" in "those awful seas." The captured terrain was just a fog-enshrouded wasteland. Those islands—parts of which are still off-limits due to unexploded ordnance—are now the Kiska Battlefield cultural site, recognized by the U.S. National Park Service. "The site," they explain, "which had never been fully surveyed, has hundreds of historic features including the remains of buildings, defensive positions, and roads." The photos seen here, courtesy of the Alaska State Library Historical Collections, show Kiska after its retaking by U.S. forces. More pictures are available in the Digital Archives. Construction battalion in Navy Town on Kiska, Aug-Sept 1943. Piles of pipe and other construction materials stacked on ground. Disabled landing craft, Kiska Harbor, Aug-Sept 1943. Several landing craft pulled up on beach or along dock. Navy Town beach, Kiska, after storm, August 1943. LST (Landing Ship, Tanks) on right; repair barge on left; across the water in background is South Head. Dump near Kiska Harbor for wrecked Japanese aircraft, August 1943. Disassembled airplane parts are strewn across ground; behind the dump are a line of ships pulled up on beach. Remains of Japanese tunnel on Kiska Island, August, 1943. Trench (or tunnel) extending from land to shore; landing craft with bow doors open to beach; other warships in background in harbor. Japanese flag shown by Canadian troops on Kiska, August 1943. Two Canadian "Fuzeliers" stand outside a wooden building with a canvas roof, holding aloft a large Japanese flag; smoke comes from the chimney pipe; debris is scattered around the shelter. Invasion craft landing troops and supplies, Kiska Island, August 1943. Ships approaching beach between Witchcraft and Vulcan Point. Amphibious craft at Broad Beach, Kiska, August 1943. Aerial view of amphibious craft on the beach and approaching from ocean; sandy. landing spit is between West Kiska Lake and Bering Sea. Japanese anti-aircraft gun on Kiska Island, August 1943. Fleet Air Wing Four soldier in leather bomber jacket inspects an apparently intact anit-aircraft gun mounted on a platform; from hillside is a view of water and ships. Aerial view of supplies landed in Gertrude Cove, Kiska Island, August 1943. Overhead view of roads, trenches, pyramidal tents, military vehicles, and supplies. U.S. landing barges in Gertrude Cove, Kiska Island, August 1943. Aerial view of cove, showing landing craft at beach and other ships near shore. Landing barges alongside Japanese ship in Gertrude Cove, Kiska, 1943. Close to shore, [abandoned] Japanese warship is boarded by men of U.S. Fleet Air Wing Four. Landing supplies on Kiska during storm, August 23, 1943. Fleet Air Wing Four unit encounters heavy weather delivering supplies; driving rain pelts the boat. Japanese winches used to pull submarines into work shed on Kiska, August 1943. Personnel of Fleet Air Wing Four inspect winches in pit; sandbags line the hillside; artillary shells and other gear at base of hill. Powerhouse and storage tank near Japanese submarine base on Kiska, August 1943. Dirt road leads past water storage tank and powerhouse. Submarines converted into scrap on Kiska Island, August 1943. Fleet Air Wing Four military personnel use torches to cut up submarines for scrap. Two-person submarines, damaged by internal explosions, on Kiska, August 1943. Fleet Air Wing Four military personnel remove incapacitated submarines from marine railway track leading to waterfront; lumber is scattered along one side; sandbags line top of hillside; winches for hauling subs are at right. LST (Landing Ship, Tanks) discharging through bow onto beach at Kiska Harbor, August 1943. Coast Guard operated LST, discharges equipment onto beach through open bow doors; the beach is strewn with bundles [barracks bags?] and boxes of gear or supplies; a bulldozer operates along shore. Datsun motorcar left by Japanese forces on Kiska Island, August 1943. Soldier from Fleet Air Wing Four inspects small, wrecked, partially dismantled automobile with air-cooled engine; steering wheel on the left side. Submarine-beaching railway on Kiska Island, August 1943. Inside view, looking seaward, of covered, Japanese submarine beaching railway, tracks leading to waterfront; a soldier passes large submarine handling cradles on left; warships are visible through opening. Invasion craft unload supplies on beach at Kiska Harbor, August 1943. Ships and landing craft, with bow doors open, line up along beach to unload supplies; large piles of lumber, materials, and provisions are stacked along the harbor shore. Destroyed hangar, Kiska Harbor, August 1943. Men from Fleet Air Wing Four inspect the wreckage of Japanese float planes inside the seaplane hangar. Japanese seaplane hangar, bombed in Kiska Harbor, August 1943. Interior view of seaplane hangar, showing holes blasted through roof; airplane wreckage strewn about, including wings with Japanese circle insignia. Fleet Air Wing Four personnel move supplies on Kiska, August 1943. Men work to organize supplies; tractor trailer transports load of boxes; pyramid tents erected in background; American flag raised on power pole over a captured bunker [machine gun nest]. Lowland mud on Kiska Island, August 1943. Areas of deep mud near shore; visible in frame are remnants of Japanese occupation: telegraph (or power) poles, fire hydrant, defensive fortifications; American warships just offshore and landing craft at beach. Wrecked cars and trucks, used by Japanese forces, on Kiska Island, August 1943. Crane piles Japanese vehicles for possible salvage or scrap. Canadian troops' makeshift kitchen on Kiska Island, August 1943. Military personnel gather around kitchen area of steaming cooking pots and dish pans; behind them is a shelter assembled from wing surfaces of wrecked Japanese planes. U. S. forces land ammunition at Kiska Harbor, August 1943. Fleet Air Wing Four personnel move boxes of ammunition from landing barge onto beach. Disarmed booby trap in bunk room on Kiska Island, August 1943. Two cans, containing sulphuric acid, have wires leading to 155mm shell. Destroyed Japanese aircraft hangar, Kiska Harbor, August 1943. Debris of bombed hangar; pyramidal tents set up among ruins; seaplane ramp to left of hangar. U. S. Troops erect tents in Gertrude Cove, Kiska, August 1943. Aerial view of Gertrude Cove area, with landing craft on beach and tents going up on nearby hillside in an area of former Japanese installations. Interior view of Japanese powerhouse on Kiska, August 1943. Fleet Air Wing Four soldier, holding a flashlight, inspects powerhouse machinery; note on verso: Several units were found, large and small, all thoroughly disabled. Japanese revetment on Kiska Island, August 1943. Embankment of earth and other materials, constructed to protect against shelling; enclosure for tool shed and battery charging rig; motorcycle on left side. U.S. Army bulldozer cleans up on Kiska Island, August 1943. Fleet Air Wing Four personnel clean up remains of Japanese machine shop; heavy pieces of metal, still set in concrete, yield to the bulldozer. Makong Kiska Airfield, August 1943. Army engineers put the finishing touches on the airfield, smoothing up the surface and hauling rocks away by means of stone boat; four soldiers work near large bulldozer. Japanese gun, mounted on dud bomb, South Head, Kiska, August 1943. Soldier examines 20mm gun, mounted on a dud bomb dropped by American forces; the bomb stands inside a pit and is weighted with sandbags. Large-caliber Japanese gun on South Head, Kiska, August 1943. Army intelligence inspects a large caliber gun that sustained a direct hit; hillside location overlooks water with U.S. warships. Japanese quarters on South Head, Kiska, August 1943. Army intelligence inspects interior of deeply reveted living quarters for men attached to A.A. [Anti-Aircraft] battery; view of jumbled interior with bunks, clothes, coffeepot, blankets,books, papers, and other items. Japanese radar station on South Head, Kiska, August 1943. Poles support radar equipment on hillside; Little Kiska Island in background; operating board in cave in small hill to right; on hillside are two 155mm shells removed from booby traps inside caves. Power unit for Japanese radar system, Kiska, August 1943. Interior view of power unit equipment room, hidden inside cave on hillside overlooking coast on South Head, Kiska. Japanese garden on Kiska Island, August 1943. Army man in leather jacket and stocking cap harvests radishes, peas, and other garden vegetables left behind by Japanese forces. Japanese fencing outfit and other gear left on Kiska, August 1943. Army intelligence man takes notes on Japanese tools, pressure gage and fencing gear; note on verso: A long bamboo club bound with leather goes with this outfit; contestants beat each other down until one gives up. Japanese shrine on Kiska Island, August 1943. Small Japanese shrine on a platform of rocks, found near quarters of men attached to anti-aircraft battery, South Head, Kiska. Japanese shrine on Kiska Island, August 1943. Long view of approach to small Japanese shrine on a platform of rocks, found near quarters of men attached to anti-aircraft battery, South Head, Kiska. Soldiers construct shelter from Japanese wreckage on Kiska, August 1943. Three soldiers construct small hut against the wind and dampness, using material from wrecked Japanese structures left on island. Wrecked Japanese vehicles, machinery, and equipment, August 1943. Military personnel walk amidst large machinery, vehicles, and equipment, much of it intact; the Japanese seaplane hangar is visible in background; power pole and wires in foreground. Office of Japanese weather station on Kiska, Sept 1943. Weather station, once occupied by Japanese, became U.S. officers' headquarters; graffiti is written across wall behind desk.